AxCMS.net supports newsletters. The newsletter layout is based on a mail template. More about mail templates here: Mail Template. To set up a new newsletter, go to New -> Newsletter. The detail page of a new newsletter is opened. Please note that some sections and buttons appear only after saving the newsletter. Saves the current newsletter and takes you to the newsletter overview page. Saves the current newsletter and lets you stay on the newsletter detail page. Takes you one step back to the newsletter overview page. Opens a detail page for a new newsletter. 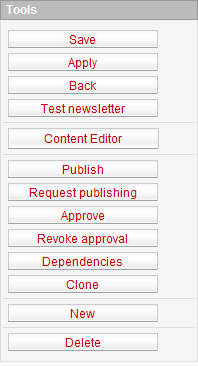 You can launch the test newsletter process with this button. This function is meant for testing the newsletter before sending it out. Takes you to the content editor of the current newsletter. You can edit the content and appearance of the newsletter the same way you edit a standard page. More about pages here: Pages. Publishes the newsletter. Please note that if no sending time has been specified, publishing a newsletter will send it out right away. Requests publishing for the current newsletter. Approves the newsletter. This function is only available for users with Controller rights for the current newsletter. More about rights here: Rights and Roles. Revokes the approved state of the newsletter. This function is only available for users with Controller rights for the current newsletter. Opens the DependencyResolverOverview page in a popup. There you can see the list of dependencies related to the newsletter you edit. Launches the cloning process of the current newsletter with all the content and sending data. If the newsletter is published, this action marks the newsletter for deletion. In order to delete the newsletter completely, it will have to published again. If the newsletter is not published, this action deletes the newsletter immediately. 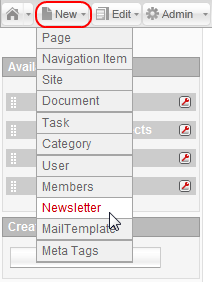 You can choose a template for the current newsletter from the dropdown menu. Enter the name of the newsletter here. The unique ID of the newsletter. This field is empty for a newsletter still being created. The user who is logged in to the system and is the creator of the current newsletter. The unique ID of the newsletter, displayed after the newsletter has been saved. With this function, you can copy content from existing newsletters for the new newsletter. When you click the Select newsletter... link, the NewsletterOverview page opens in a popup. There you can select an existing newsletter from the list, or search for a particular newsletter using the extended filter options in the Filter section. Date and time of newsletter creation. Status of the newsletter (e.g. NeverPublished, Published). Date and time of publishing for the current newsletter. If the newsletter has not been published yet, this field is empty. Date and time of the request for publishing for the current newsletter. If no request for publishing was made, this field remains empty. 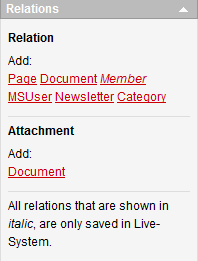 You can attach the categories to the newsletter with this function. Members who are the aimed audience for the newsletter have to be added to the same category as the newsletter. Please note that blocked members will not receive the newsletter even if they have the corresponding category attached. 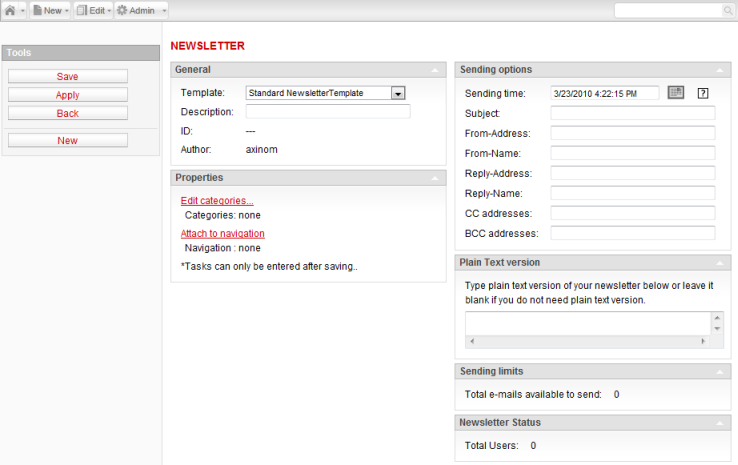 You can attach the current newsletter to a navigation point with this function. Clicking this link will open the CategoryOverview page where you can select a navigation point from the navigation tree, search for a particular node using search, create a new node or a site node using the tools from the New section. You can edit tasks for the current newsletter with this function. When you click this link, the TaskOverview page opens. You can select an existing task from the list, search for a particular task using the search, or create a new task by clicking the New button in the New section. Date and time when the current newsletter will be sent out. This field has a calendar icon on the right - clicking it will open a popup with a calendar. You can enter the time manually or select it from the calendar popup. Subject (title) of the newsletter. The email address the newsletter will be sent out from. The name that will be displayed as the newsletter sender. The email address where replies to the current newsletter can be sent. The name that will be displayed as the targeted person for a reply to the current newsletter. Email addresses that should be in CC. Email addresses that should be in BCC. 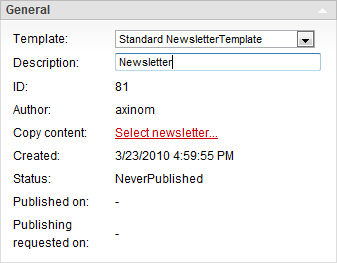 Plain Text version textbox allows you to enter a plain text version of the newsletter. If no plain text version is needed, the field can be left empty. 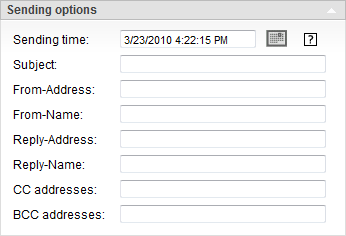 The total number of mails available to send is displayed here. Total number of members subscribed to the newsletter is displayed here. All members attached to the same category as the newsletter are considered the reciepients (subscribers) of the newsletter. Relations of the current newsletter can be edited here. This section is only visible to the users with controller rights for the current newsletter. The approvals and revoked approvals with the usernames of the corresponding responsible users are displayed here.